The finished game will allow you to switch between 2 great warriors who killed each other, but have a vendetta so deep it continues after death. You’ll be able to upgrade these Warriors with new powers and weapons, making them into some seriously undead badasses. So far the game plays wonderfully, feeling very much like a flying side-scrolling Devil May Cry (which is no bad thing), with the deliberately underpowered bullets being best used to buy time and keep enemies at bay, until you can swoop in and destroy them with your mighty sword. 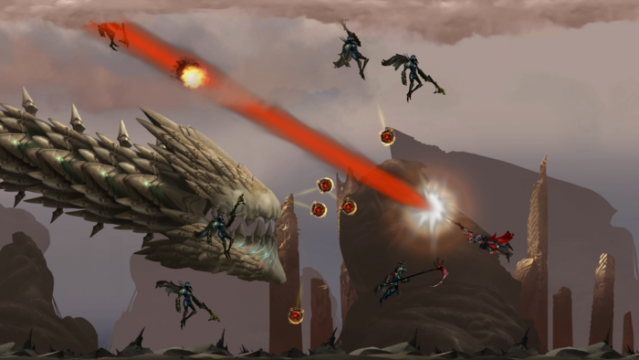 The Prototype/Demo only features single player (full game will feature co-op), and is limited to a one-hit death scenario that works as an endless runner style game. It’s still fast paced arcade fun, and very remarkably satisfying. Unfortunately it looks as if the Kickstarter is destined to fail, as they still need over $350000 with only 4 days to go. Hopefully the finished game will see the light of day somehow though as it is a great concept, and comes from Devs with an impressive pedigree.